What with all the fancy schmancy apps coming out in droves, sometimes it’s good to go back to basics. You can’t get any more basic than Blocks Mania, developed by the same minds that gave you the wonderful Tiki Totems. 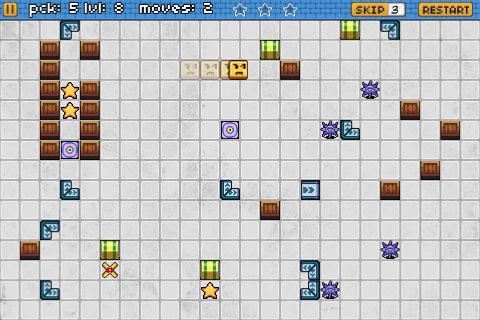 Your playing field is a grid filled with random objects, along with a small yellow block-face. This is you. The entire objective of the game is to get yourself to the square on the grid marked with an “X.” Moving is as simple as sliding your finger: the yellow face will move up, down, left, or right, depending on which direction you slide. The thing is, the face doesn’t know how to just stop. Once in motion, it will stay in motion…until it slides off the grid (game over) or is stopped by an obstacle, like those blocks of wood. Blocks Mania has over 60 levels to play, and each level gets progressively harder; new objects (over 10) are introduced as you get better at finding your way around, and each of them have their own rules. For instance, the fire will allow you to burn through the wood, while the spike maces are to be avoided. If you see a star, however, you should collect it to gain achievements. One of the best parts of this game is that there are multiple ways to solve a puzzle–just try to do it in as few steps as possible. The game teaches you how to play while you play, but I would like a little instructional tutorial that I can flip through on the main menu, as the game itself is a tad glitchy. Sometimes levels don’t load, or the instructions that tell you things you really need to know. Other than that, this app is pretty awesome. You get two themes to choose from, Doodle or Pixel (which I personally prefer). I love watching the face’s expression change every time it does something different: check it out when it’s hurtling across the grid. The game is a bit reminiscent of the days of Super Mario, and the background music completely complements that. Blocks Mania is simple but mighty, and you should really be sliding your mouse over the “Buy” button right now. It’s only $0.99, but for a limited time. AppSafari review of Blocks Mania was written by Julie Guan on July 8th, 2010 and categorized under App Store, Featured, Fun, Games, Puzzler, Strategy. Page viewed 3367 times, 2 so far today. Need help on using these apps? Please read the Help Page.